Today it was 92 degrees. That is disgusting. I am official done with summer. So, in my own form of protest against the heat, I hung my autumn flag. I felt much better after that. Hot and sweaty, but much better. Now let me talk about another "wether" issue. This is a picture of a ram lamb born last summer. I had him wethered as his scurs were not looking too great and his fleece was questionable in my opinion and he did not get sold. Hello!! This is the same wether this year (not the black ewe on the left)!! !I can not believe the difference!! His mom is Windswept Betsy. She is the same ewe that produced my 2 Ag lambs this year. His fleece is just beautiful and he of course has a great tail. Would his color be called "grey"? Shetland sheep colors never cease to amaze me!!!! Tomorrow I am taking 2 lambs, one moorit, the other, a black krunet, to be wethered. Of the many ram lambs born this year, these 2, in my opinion, have the least potential to be flock sires. They both have wonderful personalities and have minimal scur growth........I will post pictures of them in the next few days as I would love to see them in pet/fiber homes. I thought I would finish up by sharing my latest book addition, the new Gooseberry Autumn cookbook. 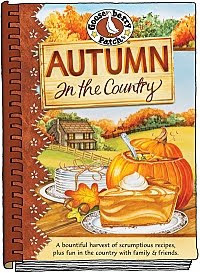 I bought this last week and just got it in the mail.......wonderful ideas for Fall!!!! Looks like a classic Ag grey to me! Hey, I may have to break out my fall stuff. Maybe that will take away some of the humidity, too. Yeah, um, let me know how the flag works. It's actually cooler here today, but the humidity is so high... Ugh. He's definetely a grey. You can see the Ag coming in in the "purse" (armpit) of him in the lamb photo.